The foremost authority on Aronia, Author and Professor Dr. Iwona Wawer, has spent the majority of her life learning, teaching and discovering the Aroniaberry. This full color 6 x 9 inch book is the first complete guide to "all things Aronia". 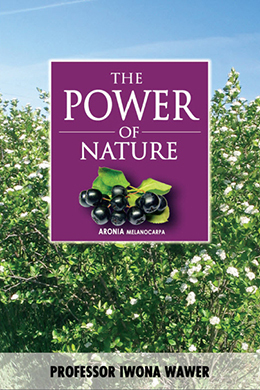 From the early history of Aronia in North America, to why we need Antioxidants in our diets, you will find more than 150 pages packed with information including scientific studies, charts and gorgeous photos of the Aronia plants, berries and plantations. Free shipping on orders over $45.